As the quarter dwindles to an end and assignments simultaneously pile up, I have less and less time and energy for creating recipes. I've also taken a break - kind of, but not really - from Instagram and I've been feeling like writing more lifestyle posts. A blogger who seems like just a blogger is not who I want to be, so my hope is that these posts let you into my life because I love it when my favorite bloggers do so for me. Okay, so about this whole Minnesota-thing. My parents moved! Our house in SoCal just wasn’t doing it for them anymore, and with both my brother and I out of the house + the majority of our family in MN/WI + the high cost of living in CA, a move back home(ish) made sense for them. They’ve officially been in the new house for a week and I was more than happy to be on the welcoming committee! Actually, can I be on the welcoming committee if I don’t live in the state into which one is welcomed? Minor detail. Funny story about my flight out there on Friday – I must’ve gotten things confused because I assumed my flight left from SLO at 4 PM, which would leave me plenty of time on Friday for a workout, breakfast with friends, packing, and spending a couple hours on campus for PHE (from here on out, I’m going to refer to my volunteer position at Cal Poly Health and Wellbeing as “PHE” which stands for Peer Health Educator – if you have further questions about my role, I’m happy to answer them!). This assumption also justified my laziness on Thursday night and gave me time to hang with a friend. When I finally went to bed on Friday night at midnight, I decided now would be a good time to double-check my flight info. HA. Haley, please don’t assume things. Your flight leaves from SLO at noon. Cancel all plans tomorrow. Nice one. Hey, at least I checked! Back to the weekend. I met the cuuuuuutest little old man on my flight out and I wished I could’ve brought him everywhere with me, but I digress. I have a weird thing with flying – it stresses the shizz out of me, but it also excites me unlike anything else. Both the takeoff and landing in a plane usually make me cry, and no I’m not kidding or being dramatic. There’s just something sorta-kinda magical about feeling the vibration of the fuselage (fancy plane term for “body of the plane”, aka the place all the humans sit) as I watch the ground fall lower and lower beneath me, or as I watch the ground bring itself closer to the wheels of the plane during landing, anticipating the calming “boom” of touchdown. Doesn’t really get old. Oh, and because I’m sure you’re just dying to know what I ate, here’s a picture. I came more prepared with food for this flight than I did with shoes for my actual trip – an accurate depiction of me. Some fresh carrots and a couple soft-boiled eggs, a little hummus, a bag of Hippeas, roasted sweet potato wedges (the star of the show, always and forever), PaleoValley snacks (like a grass-fed version of my favorite childhood snack), and RX bars. I worked on an assignment for my Nutrition Counseling class during the flight, then convinced myself I’d done enough work and picked up where I left off in Intuitive Eating. I’m reading the book and completing the corresponding activities for each chapter in the workbook and I absolutely love it. A copy of each were my gifts to Mom for her special day! My parents picked me up from the airport at around 8:30 PM and it was rather strange, as all of my arrivals home thus far have been me pulling into the driveway and just walking in through the front door. But, this is the new norm and we will all get used to it with time. By 10 PM I was in bed, barely able to keep my eyes open, even though it was only 8 PM on CA-time. But hey, when this body is tired, this. body. is. tired. I crawled into my bed in my own room – already set up for me by my blessed mother and father – and hit the lights, feeling thankful and peaceful. Saturday began at around the same time most other days do – right when the sun comes up – and I wouldn’t want it any other way. Like, come on, LOOK at that sunrise. The living room and kitchen both have plenty of windows, so that makes for bright mornings and, as I said before, I wouldn’t want it any other way. I can’t see myself living in MN, but if one thing (besides family) were to convince me of staying, it would be a Saturday morning in my parents’ living room with the sun beaming in, a hot cup of coffee in my hand, and my family next to me. Perfect is an understatement. Mom and I worked out in the basement, which is soon to become an upgraded at-home gym, even though it’s pretty dang good as it is now. All I need for 4/5 of my go-to workouts is a set of light weights and a mat, and we’ve had those at home for as long as I can remember. If you’re curious about my workouts, I’ve got plenty of my favorite moves highlighted on my Instagram stories and I also send out a weekly email that details out one of my workouts from the previous week. Subscribe! I finished a quick 30 minutes of some bodyweight HIIT moves and then explored around in the fridge for something that sounded good. Traveling, especially when a time-change is involved, throws my stomach off a bit so nothing sounded fantastic, but I knew we'd be out of the house for a few hours and I wanted to give my muscles some post-workout fuel. 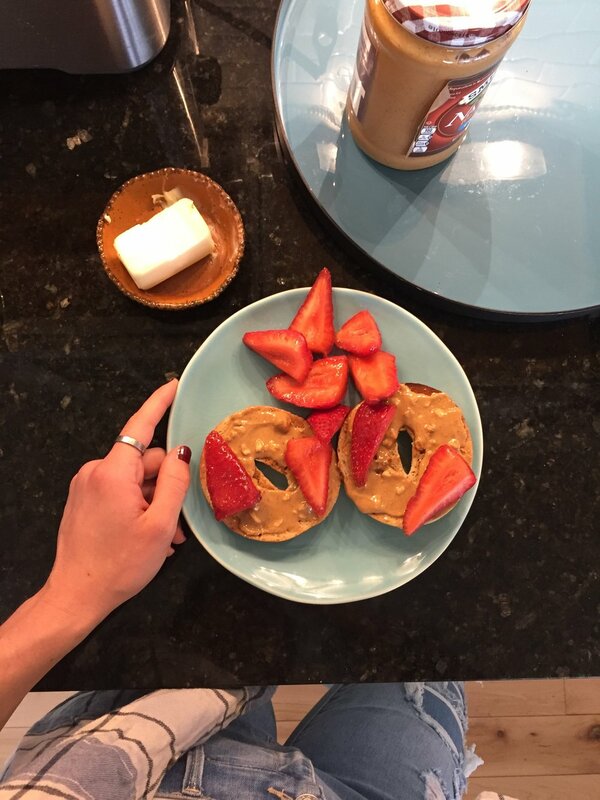 Suddenly, a whole-wheat bagel with peanut butter and sliced strawberries sounded like a winner. One thing I’ve been working on with Intuitive Eating is practicing eating without distractions – no computer, no phone, no magazines (those are the main distractions for me). This might stress me out sometimes when I feel the urgent need to respond to an email or look over a lesson plan for a class, but it also feels really good to be able to just eat, to taste and enjoy what I’m eating. It’s a simple, pleasurable act that can get easily get lost in the midst of life’s to-do lists. My parents and I hung at home with family for the rest of the night. Snacks, wine, and lots of story-telling and laughter are a given in our family whenever we all get together – not bad things at all. People have been asking why my parents suddenly decided to move back to MN, and I tell them it’s for a couple reasons, but the main one stood out tonight. Family. Family, family, family. Incredibly important to us. 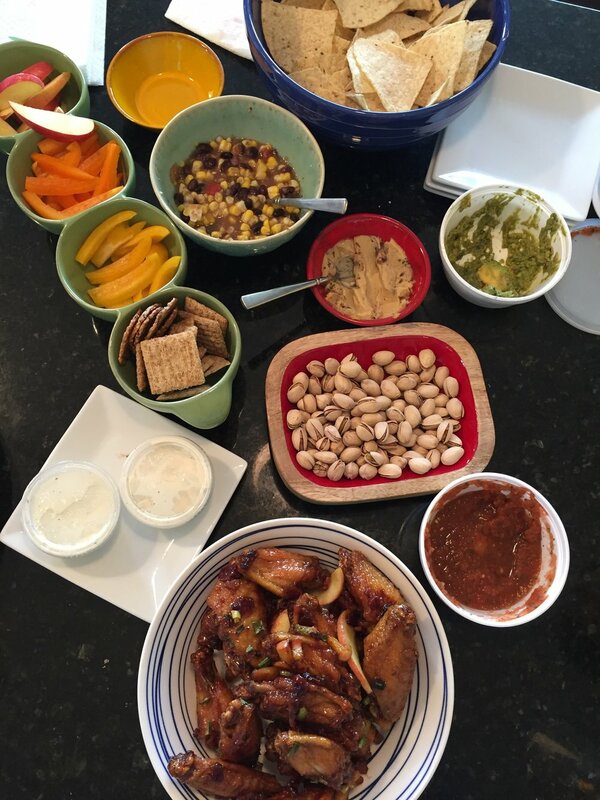 Snacks were sliced veggies, hummus, salsa, crackers and chips, chicken wings (it had been over years since my last chicken wing… just sayin’), and wine. The main event – pizza! These two huge pies came from a place most of my family absolutely adores, called Papa Murphy’s, and while I’m usually a thick-crust-lover, these were some of the best slices of pizza I’ve had. Papa Murphy, you’ve done a dang good job! The Hansen family is one of your biggest fans. By 9 PM-ish, mostly everyone had left and I realized that I’d made it a whole 24 hours – twenty-four hours – without touching my homework. I patted myself on the back for a second and then grabbed my laptop to work on some assignments. Balance. As much as I would’ve loved to lounge on the couch and listen to my family tell more belly-ache-laughter-inducing stories, my reality right now is week 7 out of 10 this quarter and multiple projects and exams coming full-speed ahead. I did future-Haley a big favor by finishing an essay and making a little more progress on my Nutrition Counseling assignment. An hour later, bedtime. I love going to bed because I love sleeping, but I think I really love it – like really really love it – because closing my eyes at the conclusion of one day means opening them for the introduction of another is just hours away. Read: another beautiful sunrise and another cup of hot coffee. Mmmm, makes me giddy just thinking about it. Mom woke up early with me Sunday morning and we chatted, ooh’ing and ahhh’ing at the blue and purple and orange and pink and yellow sunrise, and I gave her my gift for Mother’s Day – she knew it was coming, but was still stoked to open it up. 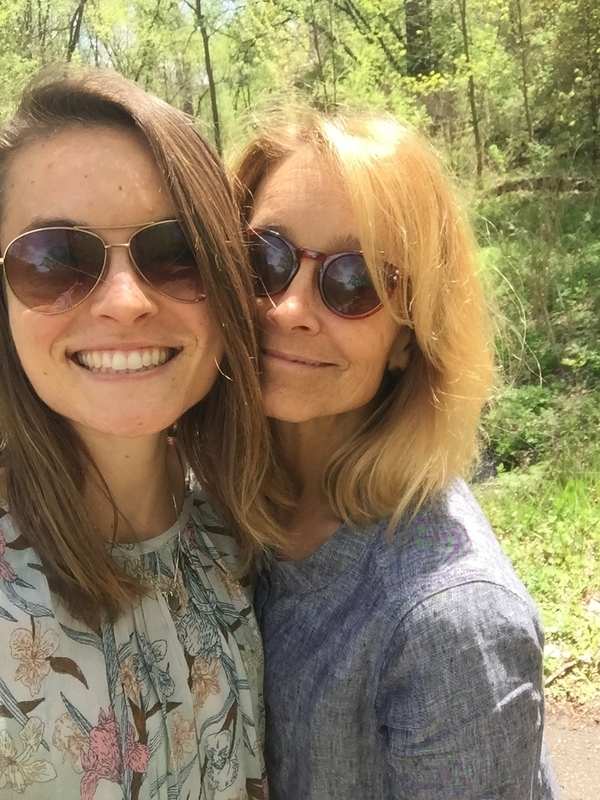 I’ve been raving to her about Intuitive Eating and we’ve talked a ton about creating a healthy relationship with food, so I’m really excited, too, to have someone as close to me as my mom with whom I can talk about all of this. She feels more like a sister than a mom sometimes. Most of the time, actually. We both went down to the basement/at-home gym for 20-30 minutes of light yoga. By then, my tummy was ready for food, so I cleaned up and helped dad cook bacon and scrambled eggs, along with some fruit and whole-wheat tortillas for breakfast. Dad and I adore breakfast, and each other, so spending time together in the kitchen cooking one of our favorite meals is, like, better than the best breakfast you could ever imagine. The rest of the morning we spent at church with my grandparents, and then drove to their place to hang out for a little while. 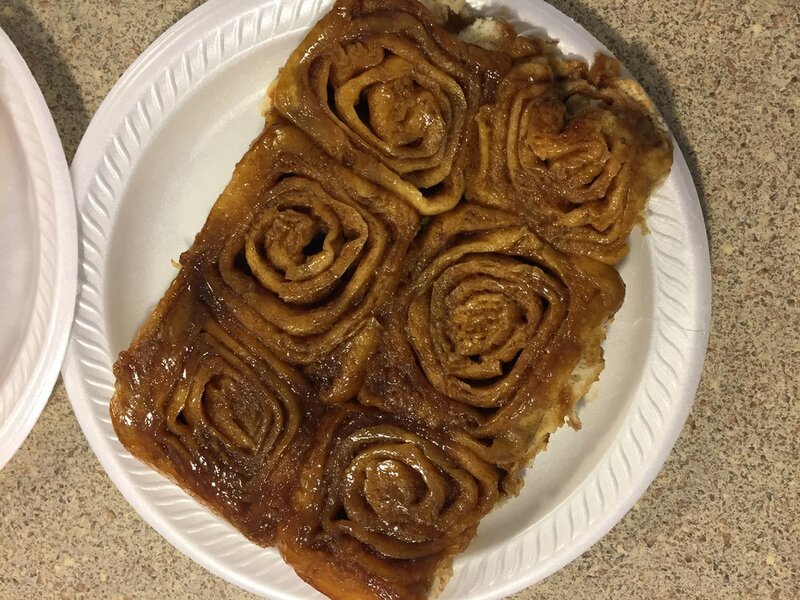 OH, and cinnamon rolls (which tasted and smelled much better than they looked) from a bake sale at church were involved. My goodness. 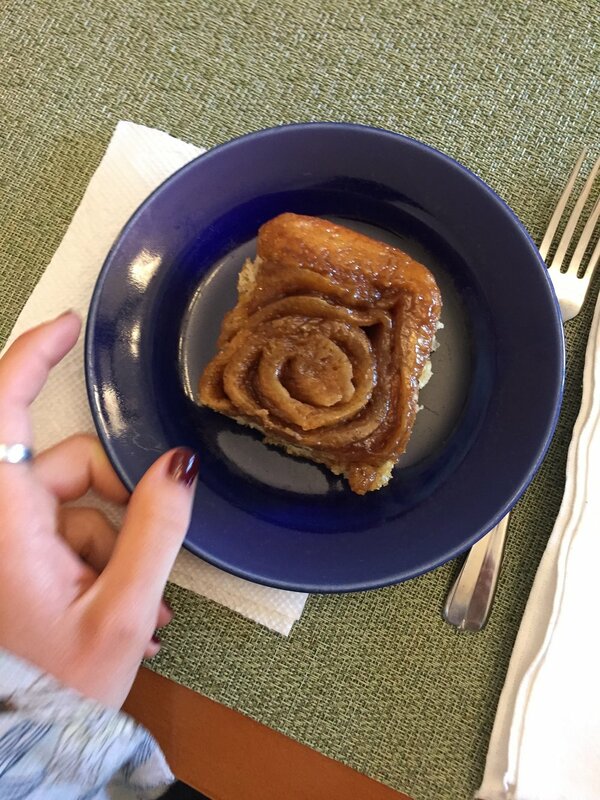 I think I should gauge a potential husband based on how he takes my breath away compared to how a cinnamon roll takes my breath away. Seems like a fair scale. Some thoughts while I sunk my fork into this swirl of warm, gooey, caramelly chunk of future-husband-comparison-scale deliciousness: Was I actually hungry to eat it? No. Breakfast kept me full and satisfied. But did the rolls smell good/look good/sound good? Did the idea of sitting around the dining room with some of the most cherished people in my life, a few of whom I rarely ever have the chance to spend time with in person, while sharing in the pleasure of said cinnamon roll sound more appealing to me than waiting until I was actually hungry to eat a “sensible” lunch (i.e. a salad, sandwich, etc.)? Yes. A million and four times YES. There are parts of Intuitive Eating I had no idea existed, but I’m so thankful they do. I read a blog post from Rachel Hartley a week ago that talked about eating even when you aren't biologically hungry or really craving a certain food, but still eating it because the moment just kind of calls for it. I can't find the exact post, but scroll through her archives and I'm sure you'll find something worth reading! And/or you can read what I wrote about the topic a while ago. This realization that food is more than just fuel/calories has helped me immensely in finding peace with food. My grandparents are two strong, determined, and always loving and welcoming individuals. They make us laugh, they show us unconditional love, and they remind us of the importance of family. I know they don’t use a computer regularly (or ever…? ), but hey Grandma and Grandpa, I love you guys to pieces. 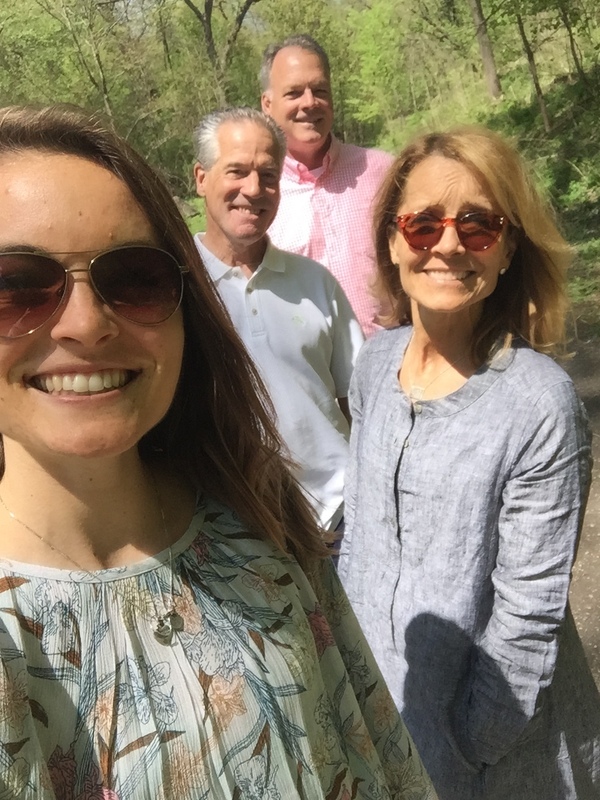 For the remainder of the day, we drove around the town my parents now live in – it’s right on the St. Croix River, and with the sun shining today, everything felt so right. I couldn’t be happier for them :) we came back home, lounged outside and soaked up our vitamin D before I packed up for my flight home.